Really intense colour, great definition. 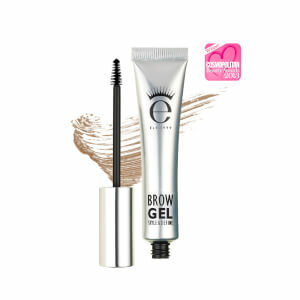 I really like this product because of the intensity of its black colour, which makes the eye look much more professional and beautiful. The brush shape is not difficult to use, it actually allows you to create the line you want due to its flexibility. Okay.. so I'm 30 and I've been wearing bold eyeliner since I was 11 or 12 (kid of the MySpace era). So basically, I've tried out A LOT of different eyeliner products.. cheap.. mid priced.. mega expensive.. and am generally always disappointed. Previously I'd been using the Tattoo Liner from KVD but I started to find it would go a bit flakey or wasn't applying so smoothly.. maybe they changed their formula. This is when I discovered Eyeko. 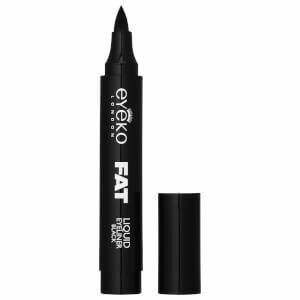 Bottom line is, this eyeliner from Eyeko is the BEST. The fine brush goes on smoothly and makes it easy to apply. It doesn't drag like a felt tip. As mentioned above, I'm 30.. so my skin is changing and it's not as fresh as it was at 18 *cries* so a smooth application is a must! It's super black, and it stays on all day without budging. I also have sensitive skin/eyes and it's never been a problem. There has been the odd occasion where I drink a few too many wines and fall asleep with my makeup on, and I wake up the next morning and it's pretty much intact! Not that I encourage you to do this ;) I'm just saying its staying power is mega! 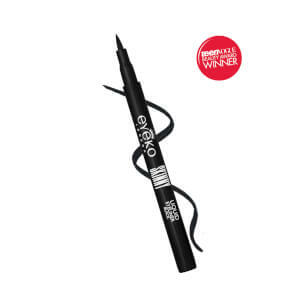 Please never discontinue this little gem, Eyeko! I've loved this eyeliner since I was bought it as a gift. I've always looked for a super fine brush and so far I'd struggled to find one until now! It has a really nice consistency and goes on my lid really easily, it stays in place really well after applying it and lasts all night! Very easy to get off with make up remover so I don't have to rub my eyes and irritate them to get it all off which I've experienced with other eyeliners! I struggle alot with doing a wing liner and always make a mess of it. I was recommended this one but was sceptical as I've used numerous ones which failed. But i was surprised to see that it was such an easy to use eyeliner with no crazy amounts of smudge and also was the perfect size brush which is thin but buildable. And the pen style makes it easier to hold. The only thing which is negative for me is the fact that its quite pricey compared to other hugh street brands and you don't get loads of product. The easiest application and yet a flawless look, absolutely stays all day long without smudging even after being sweaty and dancing all night. Even though you can't take it off rubbing with your fingers, it's super easy to remove with make-up remover, which is a must since you don't end up damaging your skin and lashes. 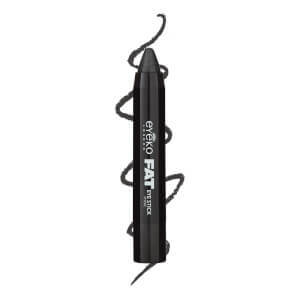 I swear by this eyeliner and purchase no other since I tried it! !